Aβ and tau seem inextricably linked in Alzheimer’s disease, but how they fit together has so far remained elusive. In the September 14 Journal of Neuroscience, scientists led by Sylvain Lesné, University of Minnesota, Minneapolis, offer the first evidence that a specific soluble Aβ assembly corrupts tau. They report that Aβ trimers trigger the microtubule binding protein to misfold. Their results indicate that the toxic duo then suppresses a protein involved in axonal transport, causing APP to accumulate. This scenario plays out in cultured mouse neurons, in mouse models, and perhaps even in human tissue. “The results add to a body of literature suggesting that trimers of Aβ may be toxic,” wrote Tara Spires-Jones, University of Edinburgh, to Alzforum. She was not involved in the research. Scientists know that soluble oligomeric forms of Aβ exist, but have struggled to characterize them. Researchers led by Dennis Selkoe at Brigham and Women’s Hospital, Boston, previously isolated dimers from patient brains, and demonstrated that they inhibit long-term potentiation and facilitate long-term depression (Jun 2008 news). Lesné and colleagues reported that Aβ dimers isolated from the brains of AD patients activate the Src kinase Fyn, which hyperphosphorylates tau at tyrosine 18 (Larson et al., 2012). Other researchers have tied Aβ to tau through Fyn kinase as well (July 2010 news). Lesné had isolated Aβ trimers from patients, but had not tested their effect on tau (Lesné et al., 2013). In the current study, first author Matthew Sherman and colleagues treated mouse cortical neurons with Aβ trimers from patients and tested for various hyperphosphorylated and misfolded forms of tau using a slew of antibodies. Sherman found that Aβ trimers, but not monomers or dimers, caused a threefold bump in Alz50 immunoreactivity in the neurons. Because Alz50 simultaneously binds regions on opposite ends of the protein, it only detects forms that have misfolded to bring those epitopes close together. The findings suggested that only trimers cause tau to misfold in this manner. Would this association hold up in humans? The researchers examined 84 autopsy samples from the inferior temporal gyri of people in the Religious Orders Study who had had AD, mild cognitive impairment (MCI), or had been cognitively normal. Lesné previously reported that Aβ trimers peak in MCI. In the MCI patients in this sample, Alz50 reactivity positively correlated with Aβ trimers, but not dimers or monomers. This hinted that the Alz50-Aβ trimer relationship was relevant to AD pathology. To study the relationship in vivo, the researchers created a new model by crossing Tg2576 mice, which overexpress mutant APP, with rTg4510 mice, which express human tau with the P301L mutation. The offspring produced an abundance of Aβ trimers as early as one month of age, but didn’t develop any kind of plaques, tangles, or neurodegeneration until after they were 4.5 months old. This left ample time for the researchers to examine the interplay of the soluble forms of Aβ and tau without interference from insoluble aggregates. Sherman found that trimer levels doubled in the crosses by three months. 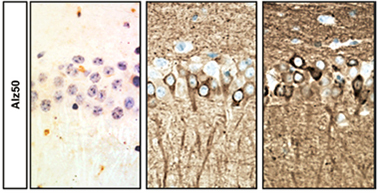 By then, Alz50 immunoreactivity had risen by 2.2-fold compared with the rTg4510 mice (see image above). At the same time, intracellular APP ticked up by almost a third. The authors wondered if this was due to impairment of transport along microtubules. Sherman and colleagues tested this by measuring levels of four microtubule motor proteins in the forebrains of these mice. They found that levels of kinesin-1 light chain (KLC1) fell by 35 percent in tau mice but by 72 percent in the crosses. In the latter, Alz50 immunoreactivity correlated with the reduction in KLC1. The same held true in the 34 MCI patient samples from the Religious Orders Study. The findings hint that APP accumulation may result from a failure in anterograde axonal transport, the authors claimed, though they reported no direct evidence of this. Were both Aβ trimers and misfolded tau necessary for the dearth of KLC1? In cultured mouse neurons, the authors found that adding Aβ trimers from patient brains cut KLC1 expression by half, but not in tau knockout neurons. The relationship disappeared if the misfolded version was removed from those neurons by pretreating with Alz50 before adding the trimers. This suggests that the misfolded tau mediates the relationship between Aβ trimers and KLC1. “The paper provides another interesting puzzle piece to explain the Aβ-tau interaction,” said Lars Ittner, University of New South Wales, Australia. The next step will be to determine how this works at a molecular level, as it’s unlikely that the Aβ oligomer interacts directly with tau to induce the conformational change, he said. Lesné agreed, noting that the two proteins do not co-immunoprecipitate. His group is now trying to identify receptors for these trimers, as well as potential kinases and phosphatases that they activate. Ittner wondered if it’s the conformer of tau itself that impairs axonal transport, or if there is another step or molecule in between. Spires-Jones praised the use of data from several sources. “This study is a nice example of how using multiple systems—in this case mice, cultured neurons, and human postmortem tissue—to examine the same question can strengthen data sets by linking associations observed in human brain to mechanisms in model systems,” she wrote. She said it will be interesting to see how the changes in this new model mouse affect synaptic function, and whether intervening in the Aβ trimer/tau/KLC1 pathway will lead to cognitive improvement. The findings support the potentially beneficial use of tau lowering therapies, she added. This is an important advance that builds on our understanding of key contributors to Aβ-induced deficits in axonal transport. Sherman et al. have created unique models in which to assess for Aβ and tau pathological interactions. They demonstrated that axonal transport deficits in AD models involve Aβ trimers, the increased levels of Alz50+ tau conformers, and that the effects of these tau species is to lower KLC-1 levels. This cascade occurs within 60 minutes in vitro. As the authors point out, there are many potential mechanisms by which Aβ trimers could induce tau-dependent loss of KLC-1. The brief time window in which Aβ/tau interactions occur, as observed in this paper as well as previous studies, including ours (Vossel et al., 2010 and 2015; Zempel et al., 2013) provides a unique opportunity to dissect mechanisms involved. It will be exciting to see how this model develops and whether new effective therapies can emerge based on such insights into Aβ/tau interactions. Vossel KA, Zhang K, Brodbeck J, Daub AC, Sharma P, Finkbeiner S, Cui B, Mucke L. Tau reduction prevents Abeta-induced defects in axonal transport. Science. 2010 Oct 8;330(6001):198. PubMed. Vossel KA, Xu JC, Fomenko V, Miyamoto T, Suberbielle E, Knox JA, Ho K, Kim DH, Yu GQ, Mucke L. Tau reduction prevents Aβ-induced axonal transport deficits by blocking activation of GSK3β. J Cell Biol. 2015 May 11;209(3):419-33. PubMed. Larson M, Sherman MA, Amar F, Nuvolone M, Schneider JA, Bennett DA, Aguzzi A, Lesné SE. The complex PrP(c)-Fyn couples human oligomeric Aβ with pathological tau changes in Alzheimer's disease. J Neurosci. 2012 Nov 21;32(47):16857-71a. PubMed. Sherman MA, LaCroix M, Amar F, Larson ME, Forster C, Aguzzi A, Bennett DA, Ramsden M, Lesné SE. Soluble Conformers of Aβ and Tau Alter Selective Proteins Governing Axonal Transport. J Neurosci. 2016 Sep 14;36(37):9647-58. PubMed.